“I’m a guy who plays for other artists,” says Rich Krueger. Krueger is a singer and songwriter who’s been writing and performing in Chicago off and on for more than 30 years, and up until now he’s been known — by those who know him at all — as something of an aficionado’s choice, a songwriter’s songwriter. He might have caught your ear with his reedy voice, or the offhand, conversational way he has with a lyric. But even then it’s not likely his name lodged in your head as someone to remember and watch out for. And Krueger isn’t exactly someone in need of validation, as music is actually his second career. “My straight gig is I’m a physician,” he says — a neonatologist, actually, at the University of Chicago, where he spent two decades earning a bachelor’s degree followed by an M.D. and a Ph.D. “I was destined to be an academic physician,” Krueger adds matter-of-factly. He waves off anyone impressed by someone who cares for newborns clinging to life and then goes home to write songs. “NOWThen” matches old material Krueger’s had in the can from his earlier career in Chicago in the ‘80s and ‘90s, when he was first meeting and putting together a group called the Dysfunctionells, with more recent material he’s written since returning to Chicago after a stint working at Cedars-Sinai Hospital in Los Angeles and in New Mexico in the 2000s. (Born in Brooklyn in 1960, Krueger actually grew up in Chicago for a while before his parents divorced, then returned to attend college at U. of C., then bounced back again after his stint out west. “It keeps drawing me back,” he says.) “Kenny’s” is one of the new songs, immediately followed by “Girls Go for Arse’oles,” a confessional inspired by his conversations with a couple of girlfriends of guys in the band back in the early days. Krueger says his artistic inspiration comes from people like Bob Dylan, Lou Reed, Elvis Costello, Tom Waits, and Randy Newman, songwriters who deal in “subjects that were all legitimate and real,” not moon-June-spoon tunes of the lovelorn. “Writing a funny song that’s actually funny is really difficult,” Krueger says. “But there is a long tradition of humor in songs out of Chicago.” He cites folk singers John Prine and Steve Goodman, and how in Chicago’s folk heyday in the ‘70s they knew comedians in Old Town at Second City — a sort of cross-pollination that continues today. And that really describes Krueger’s artistic life as well. He recalls in his undergrad days he knew future “Urinetown” playwright and composer Greg Kotis and Mark Hollmann and future “The Lifespan of a Fact” playwright Jeremy Kareken. “All of these people were friends of mine,” he says. “We all hung out at Jimmy’s” Woodlawn Tap, Hyde Park’s enduring U. of C. watering hole. All along, Krueger has made friends with the likes of Chicago folk singer Robbie Fulks, who also liked his work — “again, very validating,” he says — and Peter Stampfel, of the legendary New York City folk group the Holy Modal Rounders. (The Dysfuntionells actually backed him in a Rounders reunion show in the ‘90s.) Both play on “NOWThen,” along with various other musicians Krueger has met and bonded with over the years, including Captain Beefheart guitarist Gary Lucas. Paying for the production out of his own pocket, Krueger sometimes recruited them to come record at an Oak Park studio, sometimes sent the material out for remote overdubs. But what he knew was he wanted the finished product to be professionally polished. 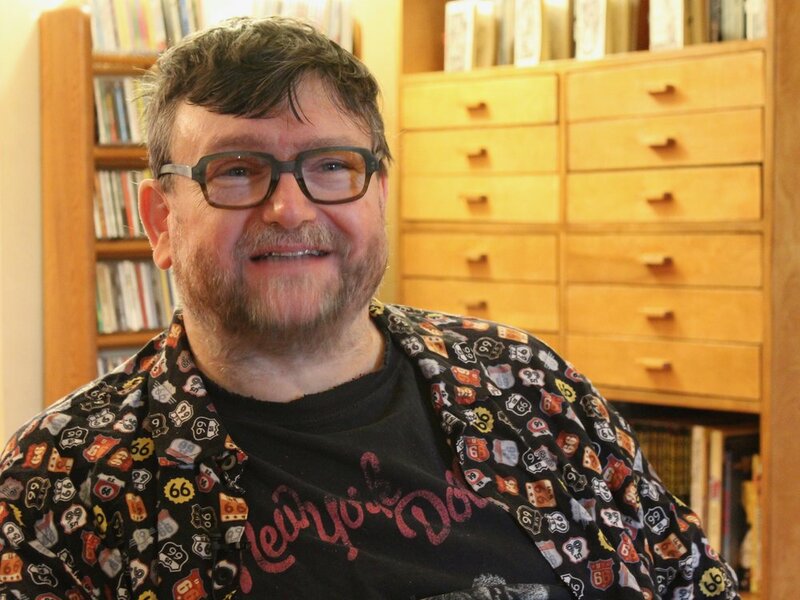 That he did, twice, recognized by two of the top rock critics in the business, but just when he seemed set to take his music to the next level he suffered a foot infection last month, complicated by diabetes, which has landed him in a wheelchair. It’s derailed performing right when interest in his work is on the rise, but he’s hoping to get back onstage with fiddle player Scott Daniel as part of the regular Paper Machete “live magazine” at the Green Mill in Chicago later this month, then resume a third-Saturday-of-the-month residency with the Dysfunctionells at the Gallery Cabaret. A European tour is possible this summer, perhaps with the band — “It depends on the money,” Krueger says — but in any case it’s not going to be like a Rolling Stones tour. “I don’t think I’m an overnight sensation or anything. It’s just I made these records now,” Krueger says. “It’s something I’ve wanted to do for a long, long time.